2015 was a year faced with a lot of natural calamities which were brought about by high rainfall that pondered the country and other parts of the world. Speaking of our own Nation various regions were faced with massive floods and several rivers breaking their banks and this took several lives as people were carried away by the ranging waters. 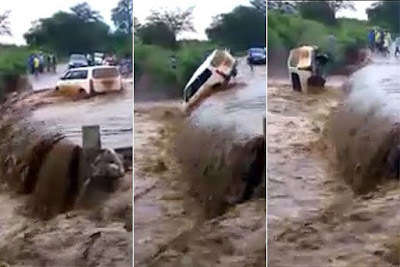 Well a video has been making rounds on social media of this probox driver who nearly died recently while attempting to cross a flooded bridge in Kitui. The driver was saved by good Samaritans at the scene before the car submerged in the river. There is about a probox that once you get behind the wheels, common sence goes out the window and your brain matter turns to porridge! Such recklessness.